The Guardian Angels program is a unique way for patients and their families to honor a Glendale Memorial physician, nurse, staff member or volunteer who made a difference in their care. 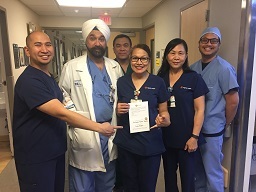 Dignity Health - Glendale Memorial Hospital is proud of our team members who practice the healing power of humankindness with their patients on a daily basis. Donors are able to recognize their Guardian Angel with a tax-deductible gift to Glendale Memorial Health Foundation that will further the mission of our hospital. Would You Like To Honor Someone Special? CLICK HERE to make an online donation in honor of a doctor, nurse, staff member, volunteer or other member of the Guardian Angel family. CLICK HERE to view a registry and photo gallery of Glendale Memorial caregivers who have received a Guardian Angel recognition. 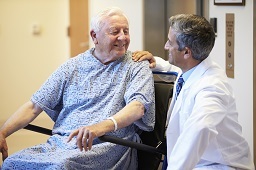 "Thank you, Dr. O'Connor for your extra-ordinary care during my surgery, treatment and recovery." "In honor of a beautiful nurse... who asked if I wanted her to pray with me. I said yes, and she said a beautiful prayer that God would guide Dr. Perez's hand and for my family. And before I left the hospital, she came to me with a beautiful bracelet - Revelation 21:4. I hugged her. I wear it every day." "We appreciate the efforts of all. Thank you Dr. Ucar for all of your help." "Your nurses are great. Your hospital is excellent. Refuse to go to any other." "Thank you, Dr. Garza, for your compassion, patience and incredible skills as a surgeon. You're awesome!"